We've been around for over a decade now and are one of the original brand names in the mobile tyre replacement market. We have developed leading edge systems to ensure you receive the best possible customer service you can experience. And it's not all about the tyres either. We want to offer you the best price we can while delivering an unrivalled service at the agreed date and more importantly - the agreed time - all the while making sure you feel completely relaxed and confident with our technician. We want to leave you feeling you have had total value in your purchase and happy that we've exceeded your expectations! Please note below a list of FREQUENTLY ASKED QUESTIONS. If we haven't covered your query, please do call us for assistance! I don't live in your coverage area but I do work in one. Can I book still? What do all the numbers and letters on my tyre mean? Do I need to provide power or anything else? Just your vehicle and the keys required! Our mobile tyre service vehicles are fully self supported workshops with compressed air and electrical supply on board. Is there anywhere you can't fit tyres? Provided the fitting location doesn't represent a danger to you, our technician or any other person and the location does not block emergency access or exit routes then unless our service vehicle is not able to park within a reasonable safe distance from your vehicle, we can generally work in most places without issue. Our service vehicles have to observe all the same road regulations and parking restrictions while ensuring safe working areas. All prices shown are inclusive of VAT, fitting, a standard rubber valve or replacement valve core (where appropriate), electronic wheel balancing and disposal of the old tyre casing. Our service vehicles are equipped with up to date computerised wheel balancers designed specifically for mobile use. We use lead free clip-on balance weights and adhesive weights for alloy wheels. We have adaptors to suit all types of wheels including centre-less wheels as fitted to certain Citroen and Peugeot models. Our balancers are also able to balance wheels on classics and some vintage models too! Yes, in most circumstances. If there is any doubt as to the suitability of a surface in terms of safety, we will ask to move the vehicle to a more suitable area. Hometyre will only repair tyres in accordance with BSAU159 (see Puncture Repairs for more details). Rest assured, however, that if a tyre is able to be successfully repaired and reused, we will be happy do so. Do you deal with agricultural tyres for tractors? We're sorry, but no. We do not have the facilities to deal with tractors. No problem. We have good relationships with most local storage sites and only require entrance and direction to your vehicle. A specific appointment time can be provided for our service vehicle to meet you on site. Do you replace tyres on motorcycles or scooters? We're sorry, but no. We do not have the facilities to deal with motorcycles or scooters. I have a caravan. The wheels have TYRON bands fitted. Are you able to change the tyres? Yes. All our technicians are familiar with the safe removal and replacement of TYRON bands and have specialist equipment specifically for this purpose. 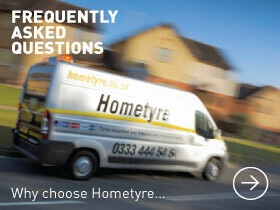 Hometyre are TYRON UK's national preferred supply of safety bands for car, caravan and motorhomes. I have suffered a blow out on the road and require immediate attention. Do you offer an emergency service? Unfortunately, no. The nature of our service is such that our vehicles usually have a pre-planned route to adhere to. If there is any way possible for us to get to you, however, we will always try. Many vehicles fitted with alloy wheels have locking wheel nuts or bolts fitted in order to prevent theft of wheels. Often these can become worn or damaged and sometimes the respective 'key' can be lost. Hometyre are able to attempt the removal of these devices using specialist equipment. There is an additional charge for this service. The successful removal is totally dependent on how the item was last fitted. Prior to removal, you will be required to read and sign a disclaimer to absolve the technician of any blame should the item fail to be removed or should damage to the item occur. I have made a booking but need to change the time and/or date. Is this OK? Certainly. We accept that everyones plans can change unexpectedly and will be happy to accommodate any difficulties you may experience in keeping a specific time. We would politely request as much notice time as possible in order for us to plan rerouting or book another customer into your time slot. This will require a minimum of three (3) working day hours in order to avoid any potential cancellation charge though! If you would like to cancel your order with us there may be a cancellation fee of £50.00+VAT. This is in place to cover the costs of returning goods and administration. Orders cancelled same day by phone or within 12 hours prior to fitment where incorrect tyre specifications are selected may be refunded in full provided a repeat order with the correct specification is in place. The tyres we supply and fit are fully guaranteed for the legal life of the tyre (down to 1.6mm of tread depth remaining) against manufacturing defects - irrespective of mileage. In the event of any suspected manufacturer defect, the tyre would firstly need to be removed from the wheel and then sent to the manufacturer or their appointed agent for inspection. Do you retain my payment information? I have paid for my tyres but have not yet received a confirmation? If you've made a payment, you should receive an email to confirm receipt from our payment provider. Your appointment will then be administered by a member of our support team in due course in order for them to confirm your details and appoint your booking into our system for fitting. NOTE: Most bookings are made without pre-payment. We are able to accept payment in advance should you not be able to be present during our visit. This contact will be made during our office opening hours only and response times will vary depending on demand and certain peaks of activity throughout the day. Should you not receive an email confirmation please contact our customer services on 0800 783 9310 or 0333 444 54 54.